Dhruva Jaishankar: What's the Big Idea? The following article originally appeared in the October edition of Pragati. A forthcoming event in Delhi that was long in the works, built upon a structural foundation laid over several years, and expected to draw considerable international attention may instead disappoint spectacularly. 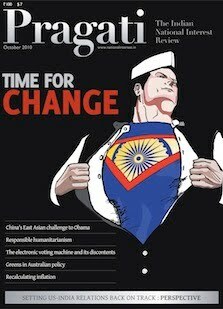 While perhaps not as appalling as India’s preparations for the Commonwealth Games, there are expectations that Barack Obama’s maiden trip to India as US president will be underwhelming. The blame in this case will have to be shouldered by both New Delhi and Washington. Of course, this is only a state visit by a serving US president. Such trips to India used to be rare events. But after only three presidential visits in the first 50 years of Indian independence, every post-Cold War US head of state will now have travelled to the world’s largest democracy. The bar should not be set too high; not every presidential visit can match the ‘reset’ of relations under Bill Clinton or the Nixon-in-China qualities of George Bush’s 2006 visit, just as Mr Obama is not expected to forge a breakthrough deal or fundamentally re-orient US policy during every one of his trips to a close partner state such as Britain. At the same time, it is not unreasonable to expect more than an extended photo opportunity. Michelle Obama in tow, public visibility will be high. The president will not come empty-handed. Negotiations on a number of issues are furiously under way in both capitals as officials try to wrap up deals in time for his scheduled arrival in early November. Announcements appear likely on a host of socio-economic issues, including agriculture and education, although the exact contours of these agreements remain to be seen. The signing of the Counter-terrorism Co-operation Initiative in July is likely to be highlighted as a tangible outcome of the strategic partnership, and major defence equipment sales—such as India’s purchase of C-17 transport aircraft—may be formally unveiled. The two sides are also planning to focus on joint co-operation on third countries, through either economic development initiatives or peacekeeping, although the exact details are as yet unclear. Lastly, there may be a statement in support of India’s bid for a permanent seat on the UN Security Council. There is, however, also enough about the forthcoming trip to suggest disappointment, even if prematurely. First, there is not likely to be a consummation of the civil nuclear agreement. This is squarely New Delhi’s problem. A breakthrough commitment on the sale of nuclear reactors had been expected, but was complicated by the passage of a nuclear liability bill that was considered less than satisfactory by US suppliers. This may set back Indian nuclear commerce not just with the United States but with other international producers of nuclear equipment. The legislation has also reinforced the view in Washington—fairly or not—of an India that is unable to live up to its international commitments. Second, there is a good likelihood that the visit will be overshadowed by Mr Obama’s own political weakening at home, particularly as it comes only days after mid-term elections on November 2. Just as easily, activism by the US Congress, similar to the recent raising of visa fees for employees of Indian companies, may also upset New Delhi in the lead up to the president’s arrival. Mr Obama has also set a bad precedent by repeatedly postponing his visit to Indonesia—a country that is close to him, personally—so there are concerns that he may feel compelled to similarly reschedule his trip to India, particularly if the Democrats perform abysmally in November. Needless to say, the signal that such a decision would send to the Indian public would severely damage the optics of the relationship. Third, a major issue that both sides are hoping to resolve involves remaining India-specific export controls, including the continuing presence of DRDO, ISRO, DAE and Bharat Dynamics on the US Bureau of Industry and Security’s entity list. During their private meeting in Washington last November, Prime Minister Manmohan Singh brought the matter up with Mr Obama, who assured his counterpart that this was being looked into. The State Department has also acknowledged that this is a priority issue, and the Department of Commerce is apparently in agreement, but bureaucratic resistance remains. If Mr Obama fails to deliver change in this area, it will negate or overwhelm many of the positive accomplishments that his administration does manage to deliver. A major problem facing negotiators on both sides is the absence of an organisational framework to advance the relationship, now that the nuclear deal has been largely realised (even though it remains unimplemented). As one possibility, the Obama administration has framed the optimal relationship with India as a ‘third stage’ of the US-India partnership, one that goes beyond the bilateral. However, there are still many problems close at hand that need to be resolved. Indian officials, led by National Security Advisor Shivshankar Menon, seem to be exploring an alternative organisational framework pertaining to the defence of the global commons, a theme that was the topic of the NSA’s speech at this year’s Shangri-La Dialogue in Singapore. If extended to its full potential, this might conceivably lead to an international network of normative guidelines championed by the United States and India, that reinforces multilateral institutions without the burden of ungainly implementation or enforcement mechanisms. Others in the Indian establishment have articulated the need for a green technology partnership, a strategic decision by Washington to help India become a developing world leader in renewables and energy-efficient manufacturing. This would be of immense benefit to both countries, and provide them with a technological edge over possible economic and political competitors. In addition, a formalised defence partnership remains a theoretical possibility, one that subsumes the many problems of co-operation and coordination caused by bureaucratic red tape and excessive oversight at both ends. A month is a long time in international politics, and there is still a small (albeit narrowing) opportunity to create a mutually-acceptable and -beneficial organisational framework that would not only make this visit a personal success for Mr Obama, but also create a political mechanism that serves the interests both of the United States and India. This will involve considerable creativity and hard work by both parties. But it is certainly no longer inconceivable.